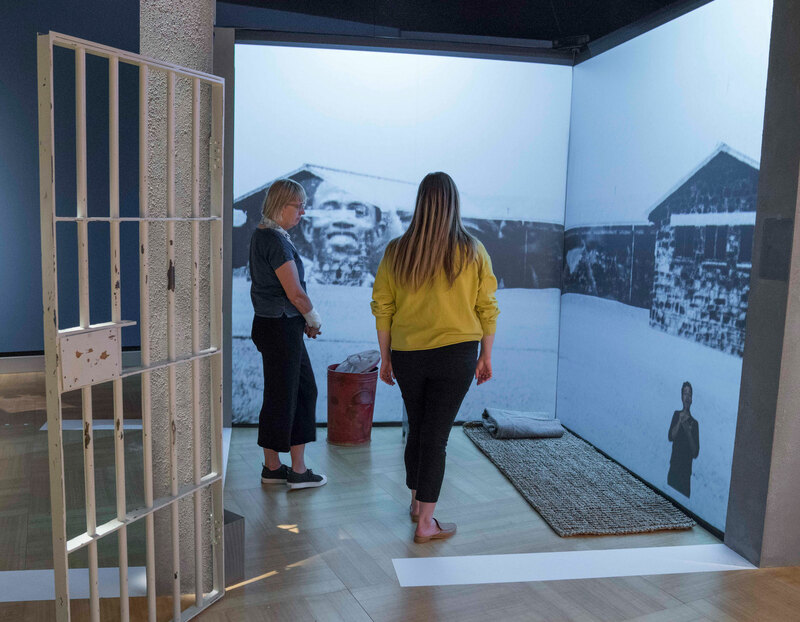 Mandela: Struggle for Freedom is a rich sensory experience of imagery, soundscape, digital media and objects greeting visitors as they explore the earthshaking fight for justice and human dignity in South Africa and its relevance to issues of today. The exhibition evolves into a life-changing journey as visitors learn about the long struggle against apartheid, and how Nelson Mandela became one of the most famous human rights defenders of the 20th century. The CMHR developed “Mandela: Struggle for Freedom” in partnership with the Apartheid Museum in Johannesburg, South Africa, adapting the Apartheid Museum’s two-dimensional, travelling exhibition, Mandela: from Prisoner to President for North American audiences. For three years we conducted research in Canada and South Africa, collaborating with other important South African institutions, such as the Nelson Mandela Foundation in Johannesburg and the Robben Island Museum Mayibuye Archives in Cape Town. Through this process, Mandela: Struggle for Freedom evolved into a much-expanded, unique exhibition featuring original research, artifacts, immersive spaces and digital interactive experiences. The CMHR tells our story sequentially, in five chapters: “Apartheid,” “Defiance,” “Repression,” “Mobilization” and “Freedom” with Nelson Mandela as the main character. In “Apartheid” visitors learn about the colonial roots of apartheid, and how it became sanctioned by law. “Defiance” follows Mandela as he and hundreds of thousands of other South Africans strove for freedom and equality by defying apartheid’s unjust laws. In “Repression,” visitors are confronted with ways the apartheid state responded to defiance with repression and violence. “Mobilization” tells the story of people throughout South Africa mobilized against apartheid, and how people around the world, including Canadians, joined in the international solidarity movement by calling for boycotts and sanctions against the apartheid state. And finally, in “Freedom,” visitors follow Mandela on his path to freedom, starting when he walked out of prison on February 11th 1990. They learn how, freed after 27 years, Mandela did not give up the struggle and, instead, embarked on difficult negotiations with his former enemies, paving the way for democratic transformation and national reconciliation in South Africa. 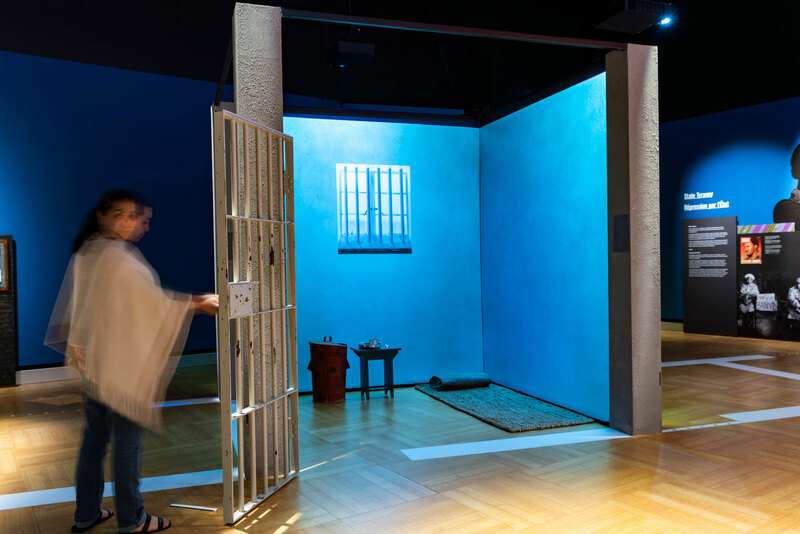 As visitors enter “Repression,” they encounter a physical recreation of a prison cell that approximates the size of the cell (and incorporates 3D objects) in which Mandela spent 18 of his 27 years in prison. Upon entering the cell, a silhouette of Mandela appears in front of the visitor using skeletal recognition, and an immersive projection cascades over the walls of the cell to tell five stories speaking to the resilience and experiences of Mandela during this time. This digital interactive contains a tactile/physical component along with interaction that takes place through projection, movement detection, and integration of audio. In the poster-making activity in “Mobilization,” visitors are invited to create posters for human rights by using a large-scale touch-screen table. They design their own posters through a virtualized collage interface using colour, symbols, and phrases in both official languages, to express their solidarity with human rights struggles. Once published, their posters appear in the gallery projected on the large wall alongside recreated posters from that time period. The posters are simultaneously published to a Tumblr page, where they can be easily shared through social media. 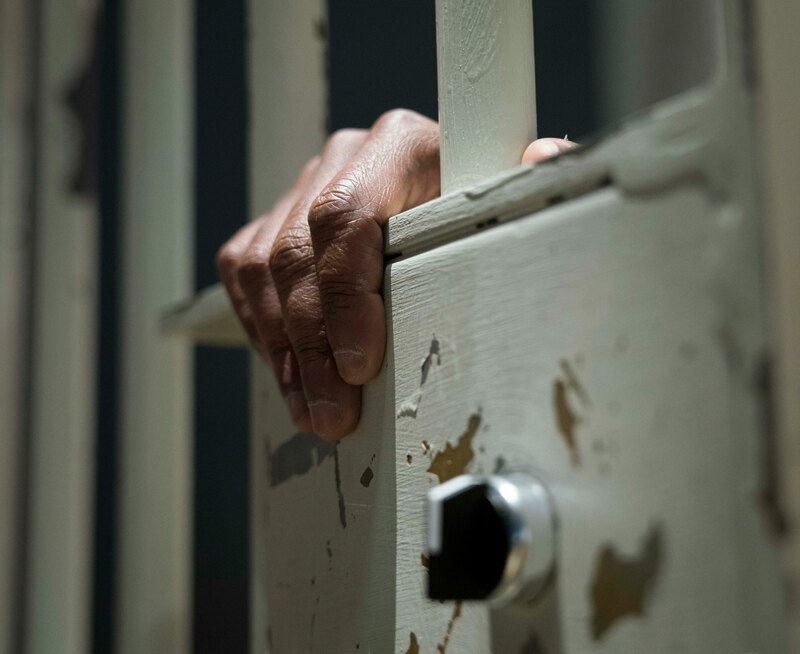 A centerpiece of the Mandela: Struggle for Freedon exhibit, the cell projection worked with the museum content, exhibitions, and digital enablement teams to define an interactive experience within the footprint of Mandela’s cell on Robben Island. Certain constraints drove iterations on the experience design: the exhibit had to be a free-standing square, use projections and proximity sensors, allow for language switching, include replicated furniture and a handful of digital images of the original cell, and be easily transported as the exhibit travels. The exhibition drew a lot of responses, not the least of which was idigenous leader Derek Nepinak fasting for 27 hours in the eight-foot by seven-foot replica of Nelson Mandela’s tiny jail cell as a personal journey to reflect on the parallels between the apartheid system in South Africa and the experience of Indigenous people in Canada. “Nelson Mandela’s life taught us that even while contained within the most oppressive and violent of racialized colonial state mechanisms, love and freedom of spirit can persevere,” Nepinak said in a statement he delivered on video before entering the cell that morning. The video has been posted on the CMHR Facebook page. Mandela: Struggle for Freedom – Cell Projection. The media program triggered while in the cell is fully accessible. You can see the American Sign Language interpreter located in the lower right corner. Closed captioning also appears on this wall. 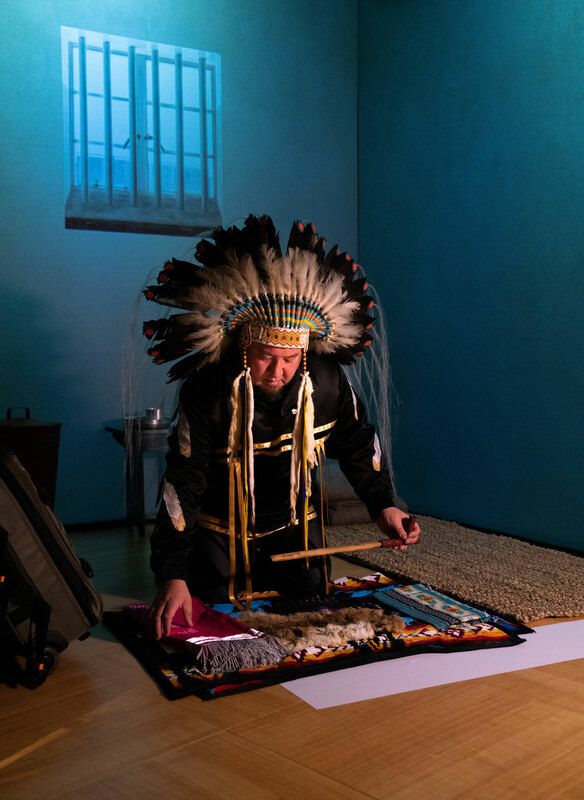 Idigenous leader Derek Nepinak fasting for 27 hours in the eight-foot by seven-foot replica of Nelson Mandela’s tiny jail cell as a personal journey to reflect on the parallels between the apartheid system in South Africa and the experience of Indigenous people in Canada. The cell used skeletal tracking to reflect the figure of Mandela on the wall directly in front of the visitor to draw them into the space. When the media program featuring 5 stories of resilience is inactive, you see the walls of the bare cell. The prisoner cell door was cast in metal, and joined to the structure where the projection scrims are mounted. The language select button was mounted where the hardware of the key is normally located.